I can’t remember my mum ever making dahi vadas at home. We usually had them when there were big community lunches or dinners mainly for weddings or we would have them at the famous Supreme Hotel. I learnt how to make dahi vadas from Nunu after my marriage. I remember when I had just got married, Nunu was preparing some dahi vadas and suddenly her friend came to pick her up. They were suppose to go for shopping or something. So bravely, I told Nunu I would finish up. Of course she asked me a hundred times if I would be fine frying the vadas and I said yes. So reluctantly she left the task to me and reminded me that they should not be raw from the inside. So there I was busy frying vadas for the first time. I had watched her doing the whole procedure. I spooned the batter into the hot oil, and fried the first batch. Just like the way she would break one to see if they are not raw inside, I did the same. Oh dear the first one was raw. So in go the rest again. By the time Nunu got back there was a marked difference between the ones she had fried and the ones I fried. Hers were nice golden brown and mine were dark brown and had become slightly hard. Thank God for the batches that she had made, otherwise the family would have had just bhajias and not dahi vadas. Now I can confidently say I do make nice soft dahi vadas, all thanks to Nunu. While frying the vadas, Nunu would keep on beating the batter with a spoon, just like the way we would cream butter and sugar for cookies or cakes. She use to tell me that the more air in the batter, the fluffier the vadas. So do give yourselves some arm exercise while making the vadas. 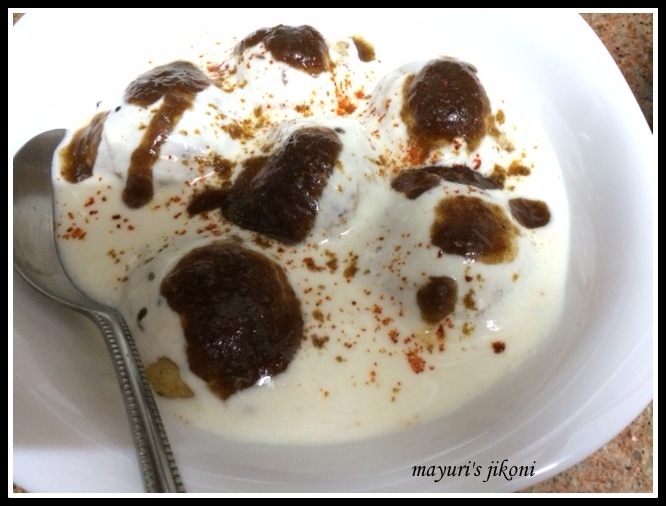 Dahi vada is a popular indian snack. Most of the ingredients are readily available in the indian shops. Nice to have on a hot summer day. After buying a paniyaram pan from India, I have been trying out bhajias and paniyaram recipes. Today I made some dahi vada and instead of frying them as we normally do, I used the paniyaram pan. I was happy with the outcome. Used very little oil and the vadas were soft. Will I ever fry vadas again? Perhaps not. Less oily and much more healthier. The recipe remains the same, you just don’t need oil for frying. You need about 1-2 tbsp of oil. Soak both the lentils separately in warm water for 6 to 8 hours. Drain out the lentils into a sieve and wash it. I usually leave the skin of the lentils. Grind both coarsely and separately in a food processor or a liquidiser. If you use a liquidiser, use water sparingly as you don’t want a runny batter. Usually about ¼ – ½ cup of water is required to grind both the lentils. If you use the food processor then add the water to the batter. Mix both the coarsely ground lentils. Add to it the rest of the ingredients mentioned under vadas. Heat the oil for frying in a wok or karai. To test if its hot, put a tiny blob of the batter into the oil. If it comes up immediately, then the oil is ready. Take a steel soup spoon or tablespoon. Have a small bowl of water ready for dipping the spoon. Dip the spoon in the water and spoon the batter gently into the oil. Repeat till you have about 6 to 8 vadas in the oil. Lower the heat and fry them till they are light brown and crispy. Make sure you keep turning the vadas with a slotted spoon to cook them evenly on both sides. I find that after every 2 vadas I need to dip the spoon in the water. This only helps the batter to slip off the spoon easily. Don’t fret, after a few trials, it becomes easier. Repeat step 7 till all the batter is over. In between don’t forget to whip the batter. Just before serving, prepare the yogurt base. Heat the oil or ghee in a small pan. When it is hot, add the mustard, cumin and curry leaves. Once the leaves become crunchy, pour the oil mixture into the yogurt. Add salt and sugar and mix the yogurt till it is creamy. Take a wide pan. Fill it halfway with water. Heat the water. When it is just hot, take it off the heat. Add the vadas into the hot water. Let them soak for 5 minutes. Gently press each vada between your palm to remove the excess water. Arrange them into a deep serving dish. Pour the prepared yogurt over it. Garnish with the fresh coriander, cumin powder and chilli powder. Serve with date chutney and if you like then extra thin sev. If you are having guests over, prepare the vadas a day ahead and keep them in the fridge. Once you soak them in hot water they will become soft. Can garnish with pomegranate seeds. I didn’t find any when I took the picture. The amount of chilli used depends on you. For the date chutney recipe check out my recipe on pani puri. When you spoon the batter into the oil, make sure the tip of the spoon is touching the surface of the oil. Gently let the batter slide off as a blob into the oil. Let it come up on its own or after a while, give it a gentle nudge from the side with the slotted spoon for it to come up. I find that when I need to fry bhajias,vadas etc, it is important to have the oil at least half way in the wok or karai. make sure the oil is hot before preparing the next batch. and what about the dahi vadas?